Of all the wonderful themed accessories available ceiling fans for kids rooms is one of the more modern and cool items on the bedroom theme scene. When I say kids ceiling fans are COOL I’m not just talking about children's ceiling fans' designs and the way they carry your chosen nursery theme all the way around the baby rooms walls and up to the ceiling. Children's ceiling fans are not only inexpensive and will fit in with your baby room decorating ideas; kids ceiling fans will save you money for years by helping to keep your heating and air conditioning bills down! Many modern homes have begun to raise their ceilings from the traditional of eight feet to ten and higher! This is a good way to keep your house cooler in the summer. One way to transform an old, adult model into a cute nursery ceiling fan that reflects your baby's nursery theme is to either buy replacement blades or paint them yourself. If your old fan is in good working order but lacks the look that you might want for your baby's room, simply buy replacement blades or paint them to reflect the colors of your baby's nursery theme. 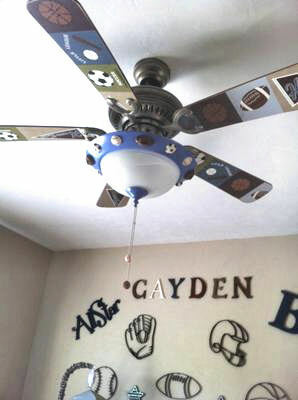 Your child's sports themed bedroom or nursery would not be complete with this All Sports kids Ceiling Fan with fan blades that have been decorated with every kind of ball known to sports fans. There are baseballs, basketballs, footballs as well as soccer balls. The only ones that are missing would be tennis balls and golf balls. With our custom made to order ceiling fans, you can have those if you wish! The sports theme hand painted ceiling fan blades add to your collection of sports memorabilia as well as to cool the bedroom its soft, quiet motion. We have coordinating all star sports theme ceramic fan pulls that match the handpainted design on the fan blades, so be sure to check them out and save shipping with one order! This hugger ceiling fan is just the thing to match the airplane bedding set in your child's bedroom. Imagine how entertaining it will be to lie in their comfortable beds and watch the green and blue airplanes circle around the ceiling following the fluffy blue clouds hand painted alongside them. The fan blades are painted with airplane motifs and cloud shapes that will coordinate with any stylish decor and add lots of charm to your airplane themed bedroom. You can also add as many as two cute airplane cord pulls to make turning this charming kids airplane ceiling fan a special occasion. The ceiling fan light kit is included. This custom ceiling fan comes with 4 hand painted fan blades, decorative glass globes and a cool light kit. The fan features three speeds and will operates in forward or reverse as an energy saving feature. If you don't need the light kit, the fan can be used without the light fixture. You will need to provide your own 60 watt bulbs as they are not included. The fan is a 52 inch model that features a low profile ceiling to blade clearance of 7 inches hugger mounted and 11.5 inches if the down rod is used. Our pretty, dainty pink Prima Ballerina Princess ceiling fan creates magic the magic of Swan Lake with one elegant wave of your little dancers magic wand. This precious baby girls bedroom ceiling fan is decorated with pretty hearts and twirling, dancing spirals in girly girl colors of pink and purple. By all means, pick up a ceramic fan pull in the shape of a ballet slipper to complete this decorative display and take your dancing theme bedroom or nursery to the ultimate level in trendy decor. In the winter we need a way to get that air circulated back down to our level and this is where ceiling fans for kids rooms come into play. We pay to heat the air in the room and then it gets away from us! Modern kids ceiling fans have the option to reverse their blades in winter so that the ceiling fan can send the hot air we were trying to escape from in summer down to the living area of the bedroom to keep us warm and cozy. 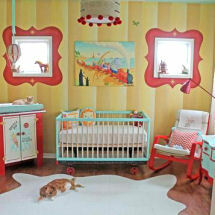 Ceiling fans for kids rooms are a double win situation! For those of us with low ceilings, low clearance hugger fans are necessary. Nobody wants fan blades chopping away at our heads so if your ceilings have a low clearance go with a low profile fan. You will still enjoy a more comfortable room temperature in your children's rooms and discounted utility bills. Kids ceiling fans have gotten so CHEAP that there’s no real excuse not to get one in place of other baby nursery lighting and get the benefit of all the energy savings. Cheap or discount ceiling fans used to mean that the fan would be noisy and have no real style or decorating value. Contemporary and modern kids ceiling fans have not only dropped in price but they have moved outside the realm of being a mere utility. They are cool and if you have a child's theme room the chances are that there are ceiling fans for kids rooms in your favorite theme that will light up your child's room, circulate your air and be cute as can be at the same time! Unique kids ceiling fans come in such cool themes! Every season there are more unique designs in ceiling fans for kids rooms, but if your chosen child's bedroom or nursery theme is not available, don’t be afraid to break out the paint, brushes and stencils and DIY your own custom kids ceiling fans. 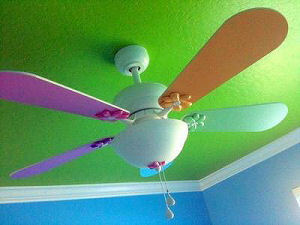 Look at the pics of modern ceiling fans in all the different themes and copy them! DIY! You can have those tired old wooden ceiling fan blades reconditioned in no time and have a beautiful decorative accessory CHEAP! If you aren't handy with free hand painting, stencil a few motifs that are in keeping with your baby room or kids room theme on the fan blades. It doesn't matter that the motifs you stencil or paint on the ceiling fans for kids rooms aren't perfect, you won't be able to see them when the children's ceiling fan is circulating the air. Ceiling fans for kids rooms are rarely still so be daring and try your hand at refurbishing an old antique or vintage fan that needs an update! Camouflage the fan's flaws and recondition that ugly old ceiling fan to compete with one of the modern ceiling fans for kids rooms on clearance sale and get it at a discounted price! Nursery ceiling fans for kids rooms are more casual than nursery chandeliers, but there are ways that we can make them more elegant and in keeping with a more luxurious girl's room. Recondition the children's fan with crystal lighting for ceiling fans. Crystal ceiling fan light kits will allow your fan to compete with any luxury ceiling fans out there and if you still want to give your kids ceiling fan a theme, use silver or gold paint to stencil a single elegant motif on the ceiling fan blades. Ceiling fans for kids rooms are so versatile that you can give them any look and coordinate them with practically any style of decor that you choose! Get best rated ceiling fans put out by a reputable ceiling fan company such as Hunter ceiling fans because your kids ceiling fans can be refurbished or reconditioned every time you redecorate the bedroom! Get a children's ceiling fan that consistently is said to last a long time in consumer reviews. There’s no need to buy new ceiling fans for kids rooms until the ceiling fan motor completely plays out! So review all the specs and pics of ceiling fans for kids rooms and other rooms of the house because ceiling fans are an investment that will benefit you for a long time! Make plans to visit this website agains soon to find the latest ceiling fans for kids, unique baby gear and nursery ideas and information on how modern ceiling fans in kids themes can save you money on your utility bills.